Going digitally dark and giving up my phone for 24 hours extended to something between 36-48 hours. It was actually pretty easy. I did make note of all the times I thought about reaching for my phone, to check the score of the Mariners game, or to look up a restaurant, or to kill time while waiting in line. I do a lot of using my phone as a pacifier when I’m waiting – I’m guessing I’m not alone on that one. It was much more difficult to get into a mindset of worrying about where my device might be. Because I knew that I had simply turned off my phone and stored it, I wasn’t worried. Since I couldn’t manufacture a sense of dread, I started to document the various things someone might have access to if they had my phone. I did a video montage of some of the highlights. If you take anything away from my going digitally dark, it’s that you should have a plan for protecting your data should your devices go missing. Facebook, Twitter, and Gmail all let you log out your device remotely, for instance (I’m sure there are other services with a similar feature). By logging out, you reduce exposure. If you take the extra step to configure automatic data backup to cloud services for things like photos and data, you could use a remote wipe feature to completely remove your data, knowing that you could easily restore the data when you get your device back. At that point, something like Absolute LoJack helps you locate your hardware, but you don’t need to be in a constant panic about what someone might be doing with your data. To close out the Absolute LoJack Challenge, I’m doing a giveaway. I lucky individual will receive a family pack of five 1-year Absolute LoJack Premium subscriptions. To participate, you need to do to simple things. First, leave a comment on my video about going digitally dark (this video). The second thing you need to do is like the Absolute LoJack Facebook page. Do both of these things no later than 29 June 2014. A random selection will be made from all participants on Monday, 30 June 2014. If you’re one of those folks who prefers to avoid Facebook, YouTube, or both, feel free to skip the giveaway. 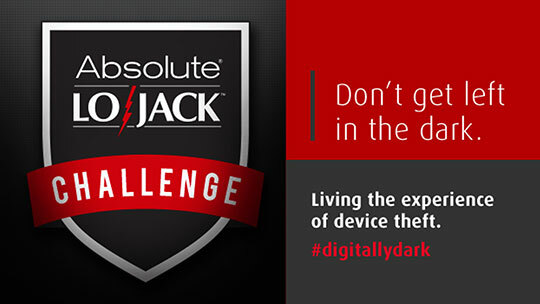 You can still save 30% on a 1-year Standard or Premium Absolute LoJack Subscription for the device of your choice by visiting the Absolute LoJack Challenge page and using the code DARK30 when you checkout.